Over the weekend, I had a chance to catch the Frontline/World segment on Haiti's aid problems since the earthquake earlier this year. The report specifically focused on the dilemma foreign aid has "caused" on the island, especially for Haitians who sell rice. My issue with this report was the fact that Haiti has had a rice problem long before the earthquake, thanks in part to U.S. policies towards the island. Excuse me for bringing this up - since NPR won't do it - but last time I checked, Haiti used to grow its own rice. I am surprised that nowhere in the program was this mention. It was almost a given that the United States was suppose to give rice to Haiti, rather than allow it to be food secure with its own agricultural resources. 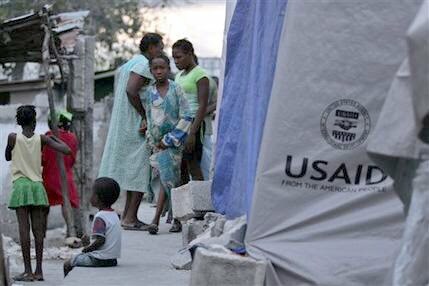 Haiti is now the third largest importer of U.S. rice in the world. The rice is "dumped" on the island by American farmers receiving subsidies from the US government to grow surpluses of rice at a rock-bottom rates, undercutting Haitian rice farmers. And some Americans have the nerve to call Haiti "the basket case of the Western Hemisphere," when, in fact, the United States and their friends at the WTO and IMF are undermining the very structure it needs to survive. I had a chance to see this amazing documentary on Current TV last night. 1. Because of the growing acceptance of LGBT folks in the United States, Christian evangelicals feel like they are losing the battle in their own country and have found more supportive and impressionable people in Africa to spread their wealth of homophobic crap. When in doubt, blame the black guy! Or this seems to be the route some French folks have resorted to in light of the country's sour loss at the World Cup this week. All racial hell has broken out. I was listening to the BBC this morning when I heard a French dude blame the loss on team members who are "millionaire thugs from the Paris suburbs." While most politicians have talked carefully of values and patriotism, rather than immigration and race, some legislators blasted the players as “scum,” “little trouble-makers” and “guys with chickpeas in their heads instead of a brain,” according to various news reports. Fadela Amara, the junior minister for the racially-charged suburbs who was born to Algerian parents, warned on Tuesday that the reaction to the team’s loss had become racially charged. You mean to tell that France isn't post-racial? Oh, the horror! Read on. Just in the last few months a French government official was convicted for making racial remarks about Arabs and the French Parliament is currently debating creating a ban on burqas. 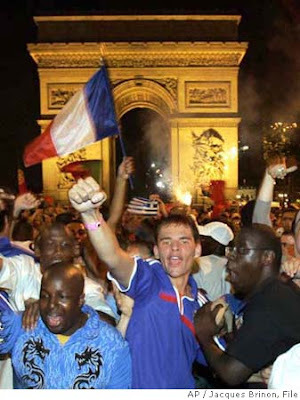 Of course, the 2005 Paris suburbs riots should have been a wake-up call to the country.